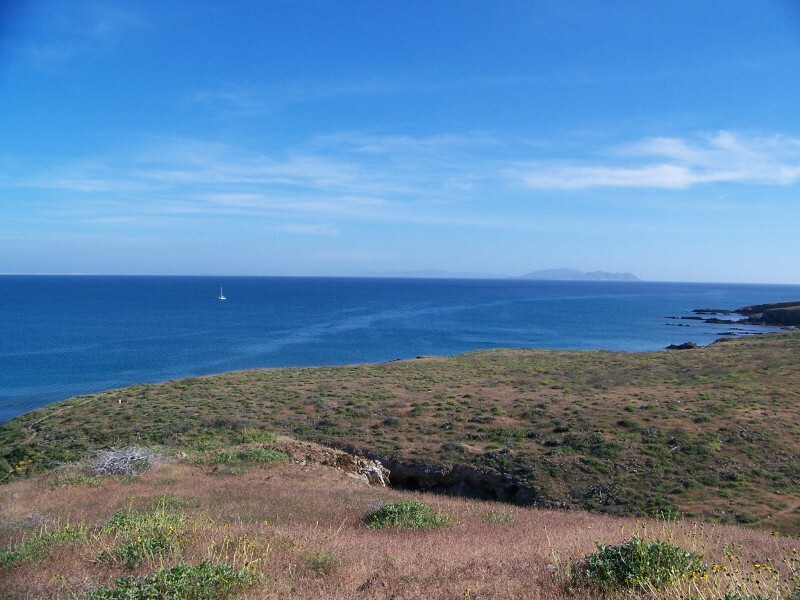 Bahia Santa Maria. Yes, that is Bullwinkle out there. Calm in the morning. We paddled over to the west shore where we could see an arroyo coming down between the hills. 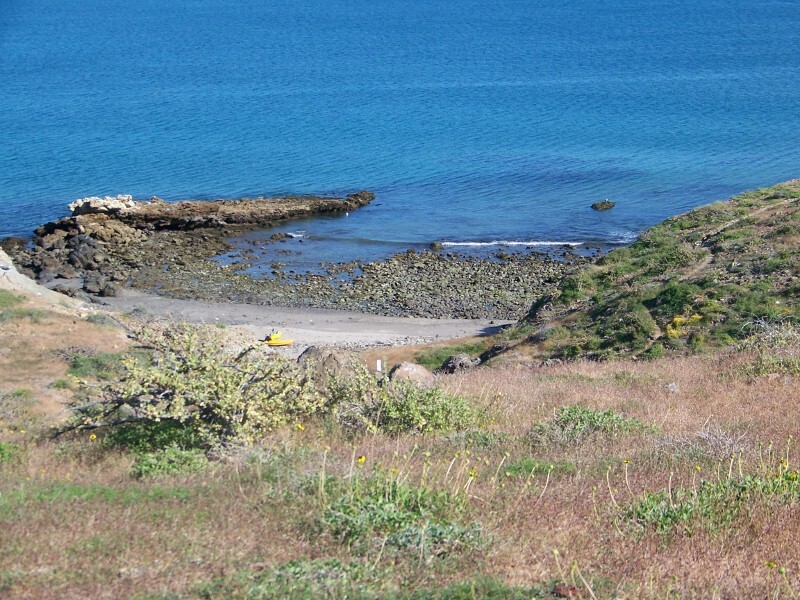 We found a small rocky beach and landed. Following the dry wash up about 50 yards we found a trail that was mentioned in the guide books and went up the wash to the top of the ridge and down to the beach and presumably over the lighthouse. 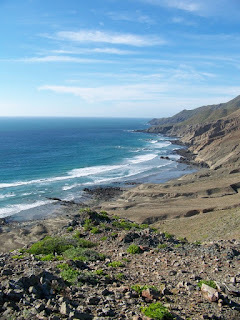 We stopped at the ridge and admired the rugged coastline to the east. It must have rained here recently. 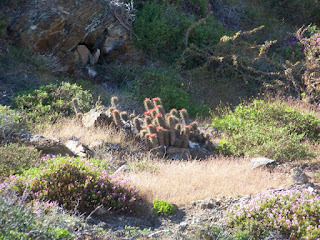 Green ground cover and lots of flowering cactus. It was a good hike. Our orange kayaks on the rocky beach landing. Our raven friend that followed up on the peaks. Thought we'd take one more day of rest before doing the last 36-48 hr strecth to Cabo San Lucas. 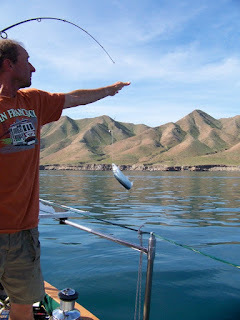 We lazed around the boat doing some cleaning and I caught a couple of one foot mackeral looking fish on bread dough. Later a couple of fishermen came by to see if we could let them have 2 AA batteries for their GPS. Of course we did and asked about the fish. They said not good eating, but used for marlin or tuna bait. Nice sunny afternoon and comfortable with the 10 knot wind. 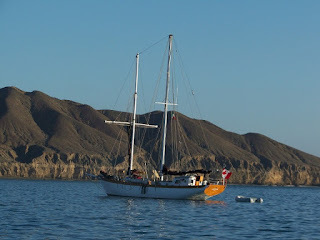 We arrived at Bahia Santa Maria outside of Magdalena Bay at about 6:15pm on 11-28. On the way in past Cape San Lazaro we were treated to dozens of whales in the water some surfacing with 20 yards of boat. Off to the east about 1/4 to 1/2 mile, one whale was doing wild tail slaps, keeping his tail vertical in air and wildly flapping it back and forth. Tracey saw several breach up out of the water......I was trying to keep from hitting any. It was quite a sight. 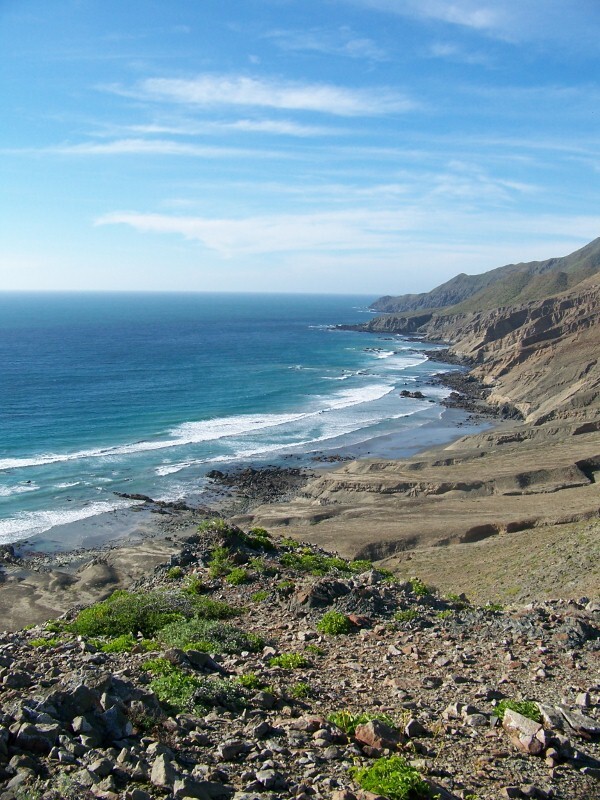 Bahia Santa Maria is huge with great protection from the swell although it still lets in the north wind. 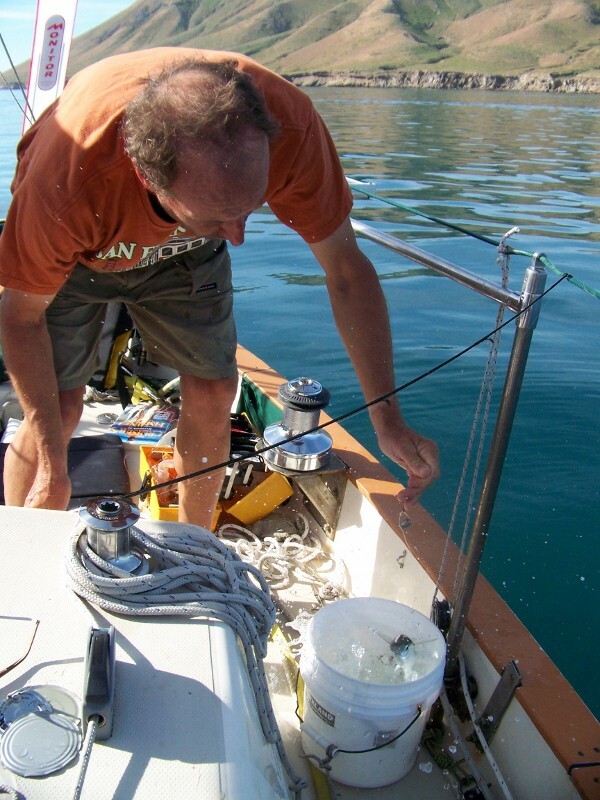 We anchored in 27' of water about 1/2 mile from the rocky western shore. 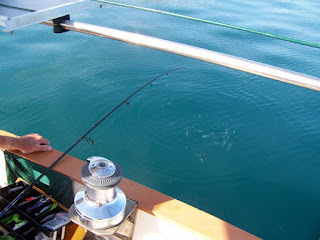 I think we could have gotten in closer but in the dark, we put the hook down once we felt comfortable. What we do depends on the weather, in particular wind. When there is wind the constant is the sails; raising, changing, adjusting, lowering and stowing. Also holding on because that usually means bigger seas. It is the same when there is little wind, but it's not as constant and the seas are usually calmer. We lay the course...well Ed lays the course and I just follow it. When there is little or no wind, it becomes a challenge, at least for me, to fight off the boredom that comes with motoring and motoring with an auto-pilot. 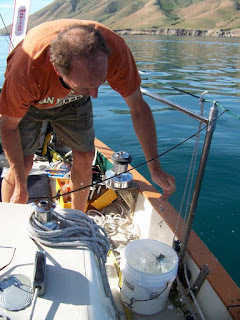 An auto-pilot steers the boat and does a much better job than I could ever do. Following land tends to provide a visual barrier to having to have something to do. I'm a visual person, so it suits me well. The shapes and colors, making mental marks or games out of how long it takes to get to different geological oddities that mark the landscape. 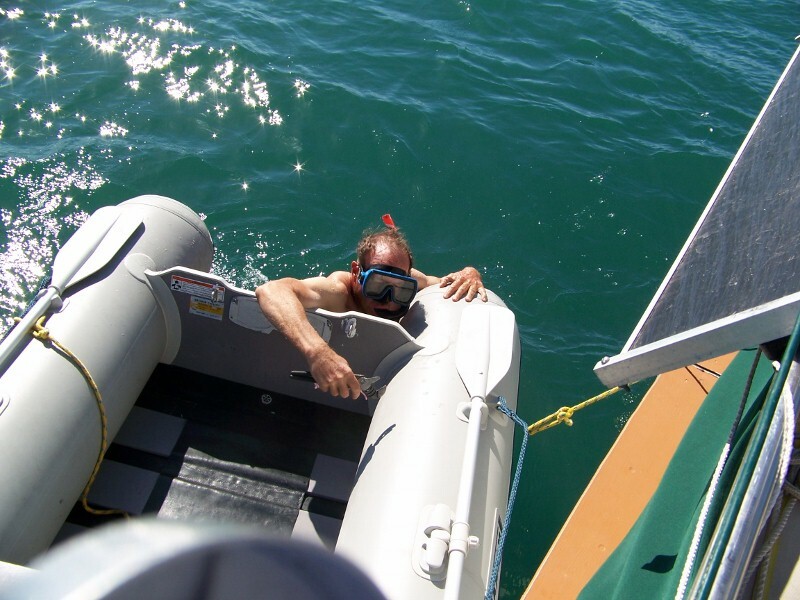 When there is no land to be seen, it kicks the challenge up a few notches. We scan the waters in search of anything out of the ordinary (ordinary being miles and miles of black ocean;) whales, dolphin, seals/sea lions, birds, pangas, panga poo and land of course. Bird activity is especially important. 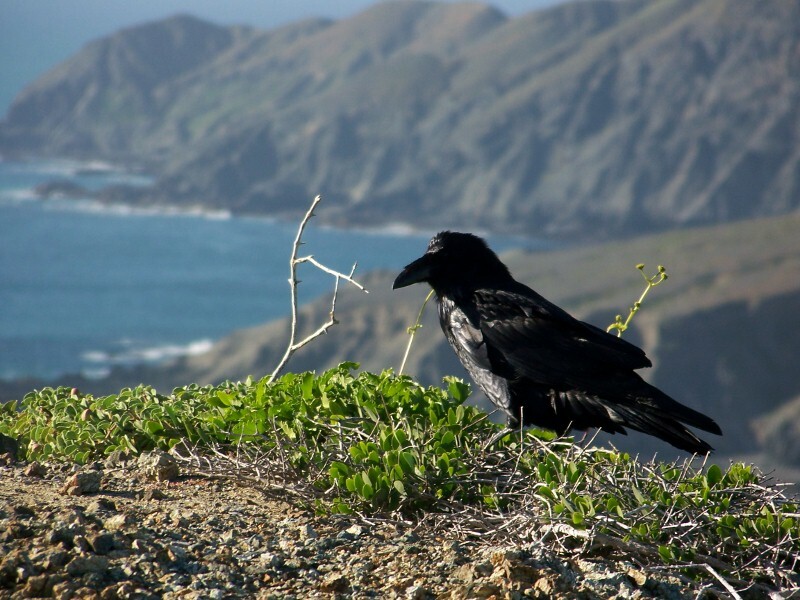 These birds are scavengers and if anything is feeding, they're on it. 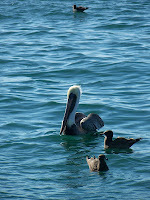 If it hadn't been for the birds, I wouldn't have glimpsed by first blue whale, and what a site to behold. Pangas are two to three man fishing boats and what I dub panga poo is the gear they dump in the ocean to catch fish, lobster, etc. Netting and pots not always marked clearly. Snagging any of these could put us in a world of hurt. 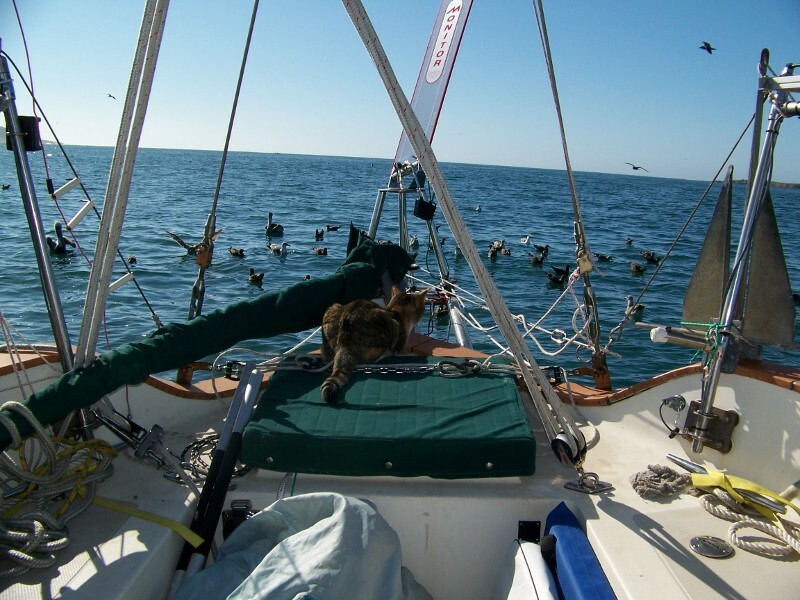 In all this vast ocean, if there is panga poo we're all over it. My mind tends to wander - a lot. If there are clouds in the sky I look up and imagine the rocking of the boat is the hammock in my garden and I'm peering up through our glorious fur trees with Mao content underneath. We read, write, listen to music, stitch holes in our clothes, have a beer. Nap. Study Spanish, although for me, just as in school, I find this tedious. We do daily chores; make water, sweep up, empty our waste (including Mao's.) We make breakfast, lunch and/or dinner, sometimes catch it (or at least fish for it.) Nap some more. And when it's warm, have a cockpit shower. 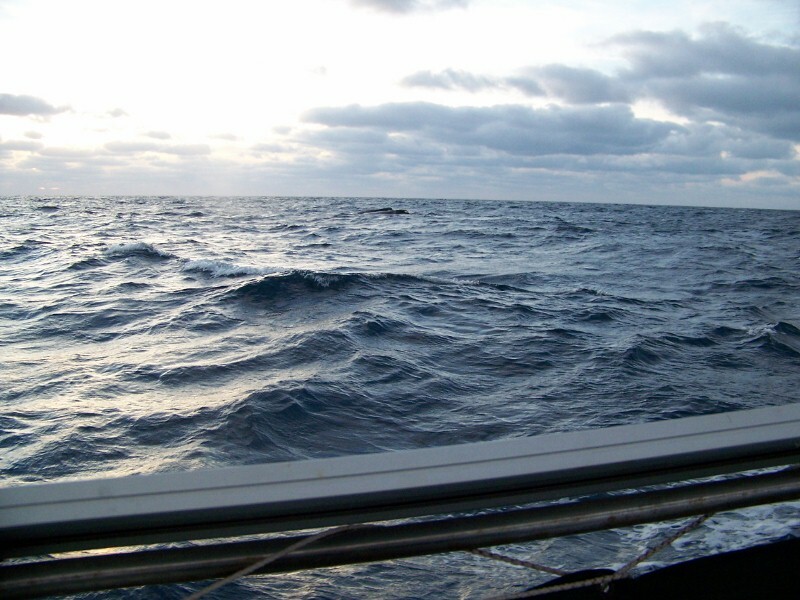 Mostly we track the wind, our course location and sit in anticipation of our next port. 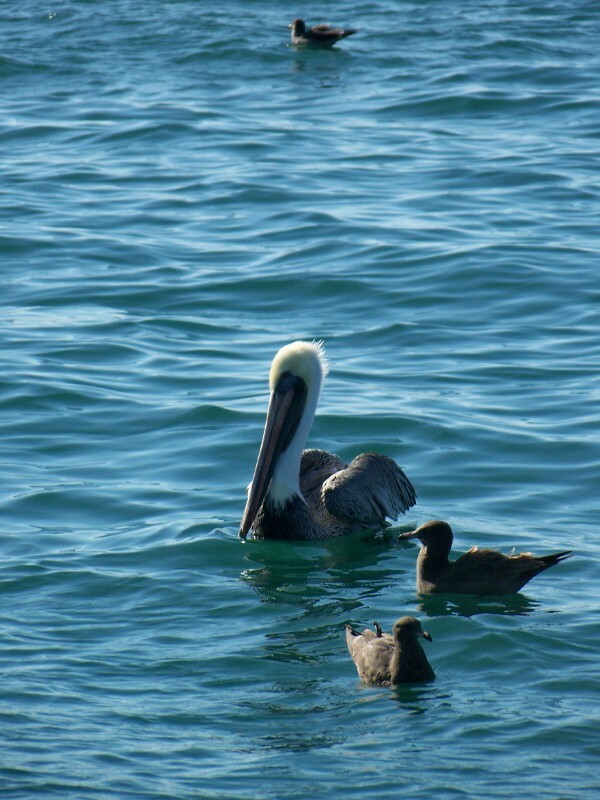 Cabo is one port away and a 48 hour sail. I can't wait until we round lands end and scoot up to LaPaz. 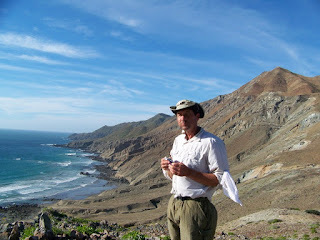 As planned yesterday (11-25) we arrived at the anchorage next to the small village of Hipolito. 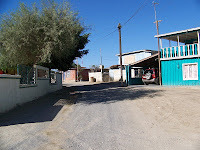 There are maybe two dozen houses or other buildings here... pretty small. Got there pretty late in the afternoon, and although its a pretty good anchorage shielded from the swell, there's still a pretty good shore break so we didn't go ashore. One other cruiser was anchored here, Chris aboard Swabby, who came by as he motored out to say hello. He left Portland in July and is working his way south. We had seen him before in Oceanside. We headed for the anchorage at Abreojos at about 8:00am this morning (11-26) and arrived at 3:45 pm. The afternoon breeze was about 15 knots, so good sailing. At the outer anchorage next to the village there was quite a bit of swell wrapping around the point, so we moved about a mile SE to another anchorage more protected. No swell, but still windy. 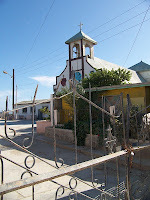 They do have cell phone coverage here so we were able to check email and upload this blog update. Tomorrow, if the wind and swell die down some, we may move back in front of the village and kayak in to the market. 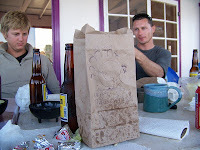 Then we plan on leaving for Magdalena Bay 130 miles down the coast. 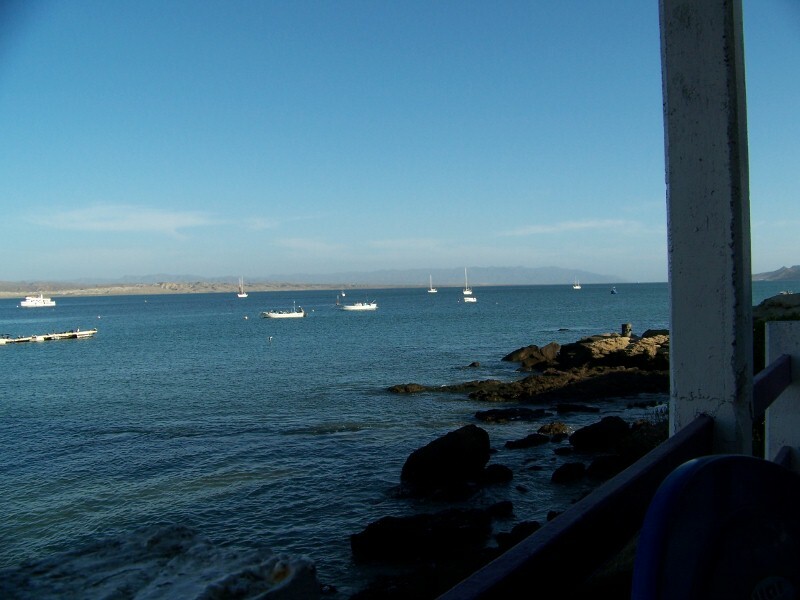 That's the next major stopping spot before the 185 mile sail from there to Cabo San Lucas. We arrived at Bahia Asuncion and had the anchor down at 11:00pm last night(11-24). 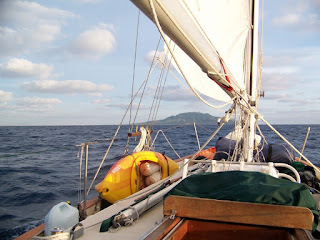 It was a 50 mile sail from Turtle Bay and we tried to do as little motoring as possible to conserve fuel. We had mostly 8-10 knot nw winds at our back, so flew the jib and free flying headsail winged out. The boat tracked along at about 3.5 knots. Bahia Asuncion is a pretty big village, but we didn't go ashore and spent the morning sleeping in a bit and then working on the internet trying see what flights are available for Molley and Sal to come down in January. The Telcel Banda Ancha Movil usb stick that connects us to the internet via cell phone continues to be a good decision. I think cell phone coverage is ever expanding here. 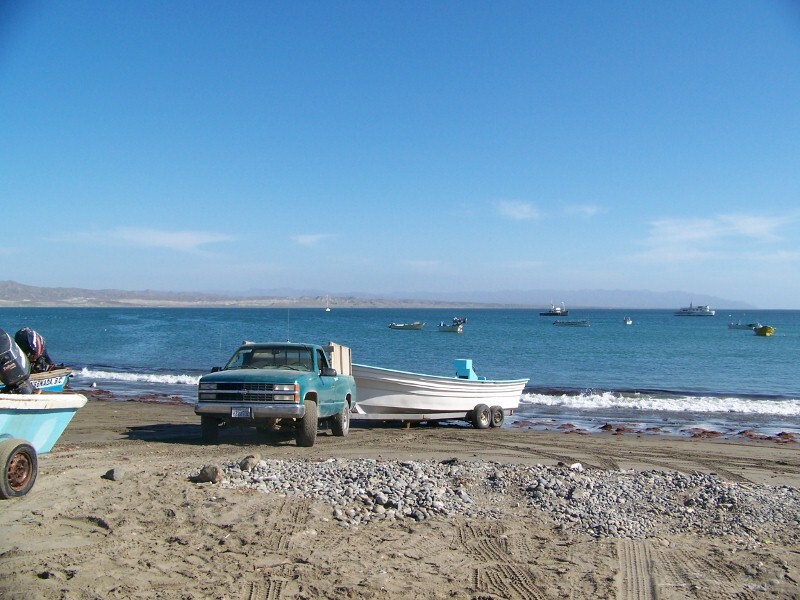 We left Bahia Asuncion at 12:00pm headed for another little village anchorage at Hipolito about 20 miles away. We were going to head out today but spent more time celebrating yesterday than planned. The forecast for the next week is good, so we'll head out in the morning. After being met at the dock by Pedro yesterday, whos job is apparently guiding us to whereever we needed to go in town for a small fee, we hit a mini market for some tecates and walked through town. We met up with the other boat crews for an impromptu Thanksgiving, bringing spare munchies to share and swapped sailing stories getting down, and with one couple on 'Jumble' bashing their way back up, the coast. They brought popcorn, which I don't mind saying went very well with the brews. As that gathering was wrapping up, we watched a double masted wooden schooner with a yard arm come sailing into anchor. 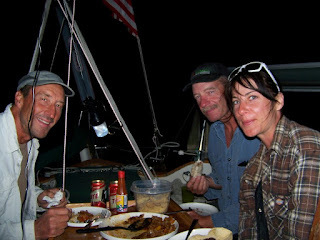 Ed immediately recognized her as the 'Sara M' with skipper Allen, who we met back in Two Harbors. Kayaking back to the boat, Ed headed over to say hello and we were invited to dinner with he and his new crew member, Leah (hopefully not butchering the spelling of both names.) That morning before leaving Cedros, Allen and Leah had received 6 lobsters from a local fisherman. He said the guy just gave them to him and wouldn't take any money. So lucky us, that's what we had for dinner. Needless to we still have the spam turkey...maybe Christmas dinner? Wonderful conversation, good food, nice Thanksgiving. This morning I made myself a bowl of cereal and the could taste the milk was turning. So I dumped the cereal over the side and suddenly every bird in the bay was at our stearn. Mao loved it. Today was spent getting chores done before departure manana. 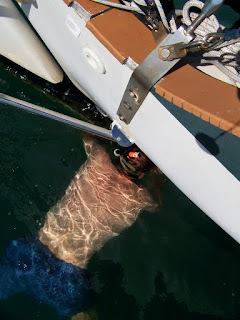 Ed had some work to on the rudder and said the water was a bit chilly initially, but wasn't bad after he was in for a while...right. Leah and Allen stopped by for a drink and ended up having fajiatas with us. Another evening of good conversation, good food and new friends. 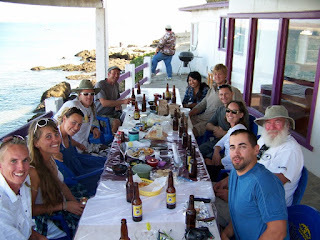 Hope to catch up with them again further down the coast. Don't think we're going to try and plow through to Mag Bay, rather stop in a couple of anchorages noted in our books. Happy Thanksgiving everyone!! Ed and I have successfully made it to Turtle Bay! It doesn't look like much on film, and apparently has been called 'coyote ugly', but it is a nice stopping point to build more courage for the next couple of legs. Will kayak onto the beach for a little exercise and walk into town for a look-see, come back and make spam turkey for our thanksgiving dinner. Love much. As Ed noted in the last entry, after three days and two nights of sailing we were able to anchor for a well needed rest at Cedros Island. Sunrise was beautiful and calm. By the way, both Ed and I were going for the 'original' Isaac hair-do! 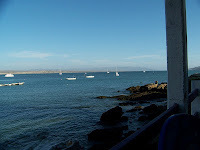 We left Ensenada on Sunday morning, after running up to Marina Coral for fuel. The downtown marinas, Cruiseport Village and Baja Naval, don't have fuel docks. 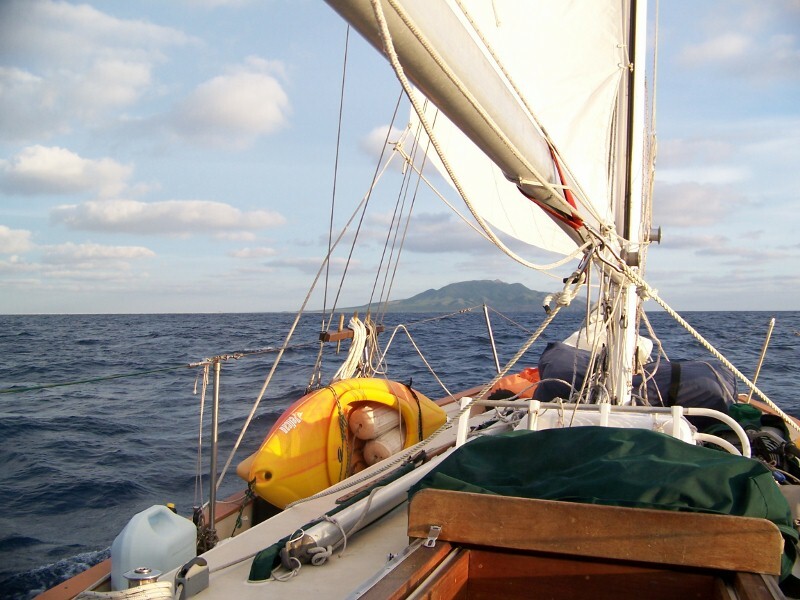 We motored out to the western point of the harbor turned Southeast and raised the sails. A nice wind of about 15 knots, but also fairly large 7-8 ft swell. I forgot how much effort it takes to do stuff when the boats rolling around. Definitely had to get out of the vacation mode and back into the moving the boat mode. We had decided to head for Bahia San Quentin about 110 miles from Ensenada. 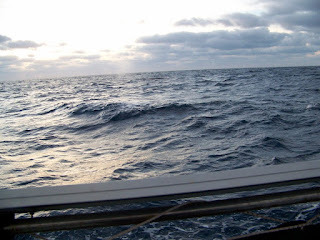 The 15-20 knot winds kept us moving along nicely with the jib and staysail winged out or later by jib alone. But, wow the swell coming out of the NW made it one of the rolliest nights ever. Tracey was doing fine though, with the dramamine working for her, but making her a bit drowsy. 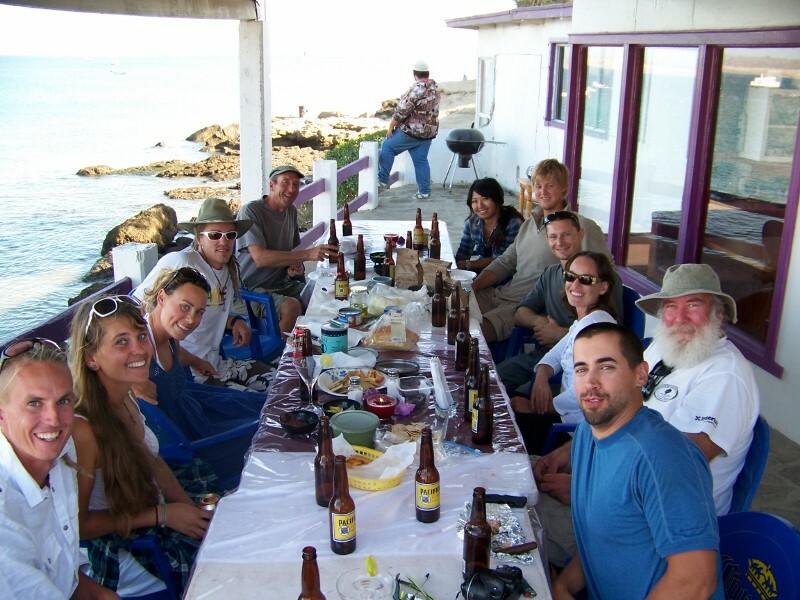 We sailed on through the night and arrived outside of Bahia San Quentin at about 2 pm. 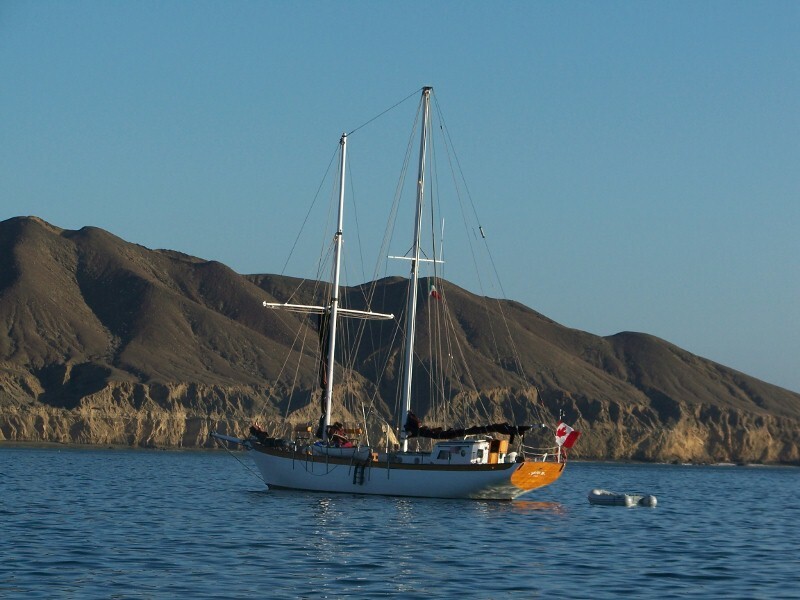 We decided we didn't want to waste this good wind so we made the decision to keep going to Cedros Island and an anchorage on its east side. We could make it before dark the next day. So onward for another nice. (Man, these 12 hour nights are much longer than the 7-8 nights of summer, but the stars are wow !!). Tracey's a trooper and doing most of the sailing during the day and I take over at night. Arrived at the open anchorage up against the steep hill side of the island. There's good protection from the swell and waves, but there's an arroyo(gully) and the wind sweeps down through that making it pretty noisey. However is nice to be able to cook up a better dinner than you can while moving along. All told we did about 245 miles over the two days. Tomorrow, we'll hit Turtle Bay. A very protected and large bay and one of the few places to buy fuel. Oh yeah......we saw a bunch of whales today. Not sure but they could have been blues. WE MADE IT TO MEXICO!! Arrived late afternoon on Wednesday after leaving at midnight from San Diego. 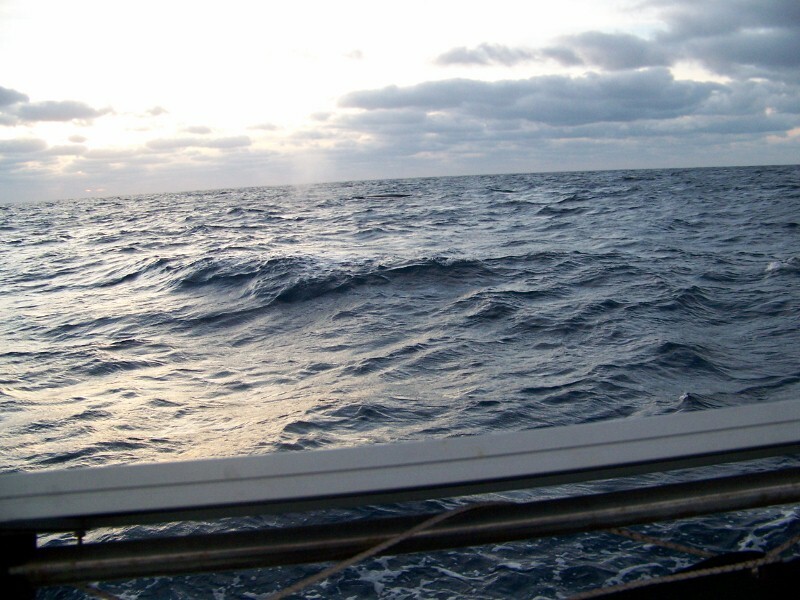 It was a smooth motor – no winds at all, so no sailing, and calm seas. Leaving Mission Bay, I had to stand at bow for lobster pot duty – no easy feat in pitch black; made easier however with a high powered flashlight. I bet we woke all the live-aboards with our yelling. Standing at bow and having to yell back to Ed whose standing in the cockpit, where the most engine noise is, and he being deaf in one ear...good lord, I'm sure we sounded just like my parents in the old two story house! 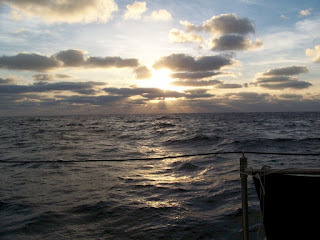 Once underway I went below to sleep until dawn. I woke to the most beautiful sun rise and the Coronado Islands. 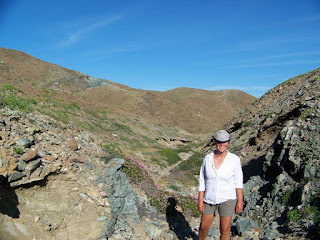 After Eds downtime, I went back down to sleep off the dramamine and woke again an hour outside of Ensenada. Cruise Port Village Marina is where we're docked now. I was a bit worried when we first got in; a lot of noise/activity outside of the marina as well as a cruise ship port, with a cruise ship docked, next to the marina. 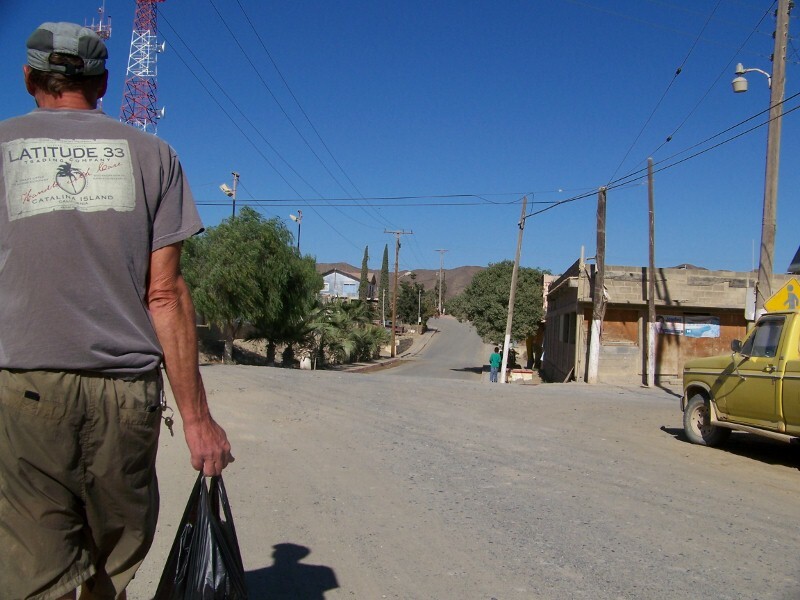 Come to find out, it was the night before the start of the Baja 1000. A big motor car race that ends in LaPaz! If you've never heard of this race, it's something. I heard about it because of the many spectators hurt. If you've ever watched the spectators during the Tour de France, it's the same thing with this race, except people don't seem to get that a vehicle can kill! And you should see these cars – super charged – and loud. Really loud. Mostly white people racing. We were told only 5% of the racers are Mexican. One racer didn't make it out of the city and tore apart their car right in the middle of the street! Great staff here at the marina. Today we had to check in, get our visas, etc. It took us three hours and that was with no lines and the help of Enrique. I can only imagine what would have happened if we didn't have him! Headed to the market and passed a real Christmas tree lot. The smell was wonderful. Once in the market we had to listen to American Christmas music over the speakers. It was nice but made me sad, never having spent Christmastime away from Molley or the grandkids. 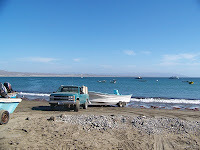 Speaking of holidays, we thought we'd be in LaPaz for Thanksgiving, but we're at least a week behind schedule, maybe a bit more. And our stops down the coast will put us further behind, so we have no idea where we'll be. That's o.k., our spam turkey will keep. Adios amigos. We left Seaforths Marina in Mission Bay at about 1:15am this morning and crossed the border at 5:00am. No to light southerly winds and some low fog but not much. Could see the stars all the way until dawn. 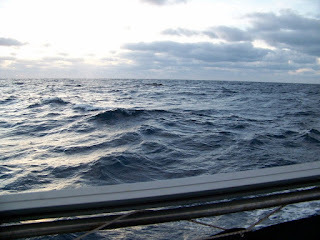 Motoring along at about 5 knots and should get to Ensenada at about 3:00pm. We talked with the Cruiseport Village Marina folks in Ensenada, who will help us get all the right paper work in order to clear in tomorrow morning. Will let you know how it all goes. By the way, Seaforth's Marina in Quivira basin, in Mission bay was a nice place to stay. Nice folks in the office and on the dock. Woke this morning to clear skies and cold, so it was slow going getting out of bed. After breakfast we decided to take a bus ride to La Jolla. The best way to discribe it is 'money'. Beautiful area, but Seattle's 5th Ave for a couple of miles. 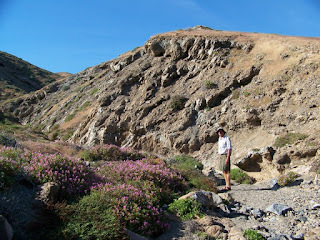 We visited 'the cove'; a small beach area among the rocky cliffs where swimmers braved the cold and the sea lions. 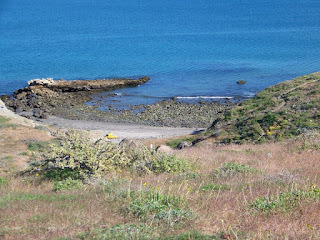 Several arches gave the area some great low tide sea life viewing and many many sea birds and sea lions sunning. There was a section that whipped up the worst fishy breeze ever. The kind that made me think if I opened my mouth I'd be able to taste the smell! Horrid. I don't know how the restaurants along that smelly area stay in business. Stopped in at the local farmer's market, that had more crafts than veggies, and checked out the town. I broke down and bought our Christmas tree, thinking it would be my last chance to get something festive - not knowing exactly where we'll be. First time in twenty years that we've got a tree before the 2nd week in December and plastic...but I'm sure it'll be perfect with the fir scented candle Molley added as a surprise in the package I had her send. The best smell ever. What a great daughter! Forgot the camera - so no pics. Latest plan is to top off the gas tomorrow, anchor in Mariners Basin and head out around midnight or there about.